Ecoline Brush Pens are a liquid watercolour pen available in 29 vivid translucent colours. Manufactured by Royal Talens they contain a concentrated water based dye ink in a gum arabic solution that is extremely vibrant (giving best results on white or very light paper). With this special formulation the ink has a short drying time, and when dry it is not waterproof so it can be reworked further at any point. Being brush pens they have all of the versatility of watercolour paint in a pen. They can be used for quick sketches, additions to existing work and due to the brush tip both fine and thicker lines are easily achievable. The brush nib varies from approximately 4mm at the base to less that 1mm at the tip - varying pressure will give you a whole range of different stroke widths. To further enhance your work you can add water with a wet paintbrush, or use the blender pen for controlled blending. 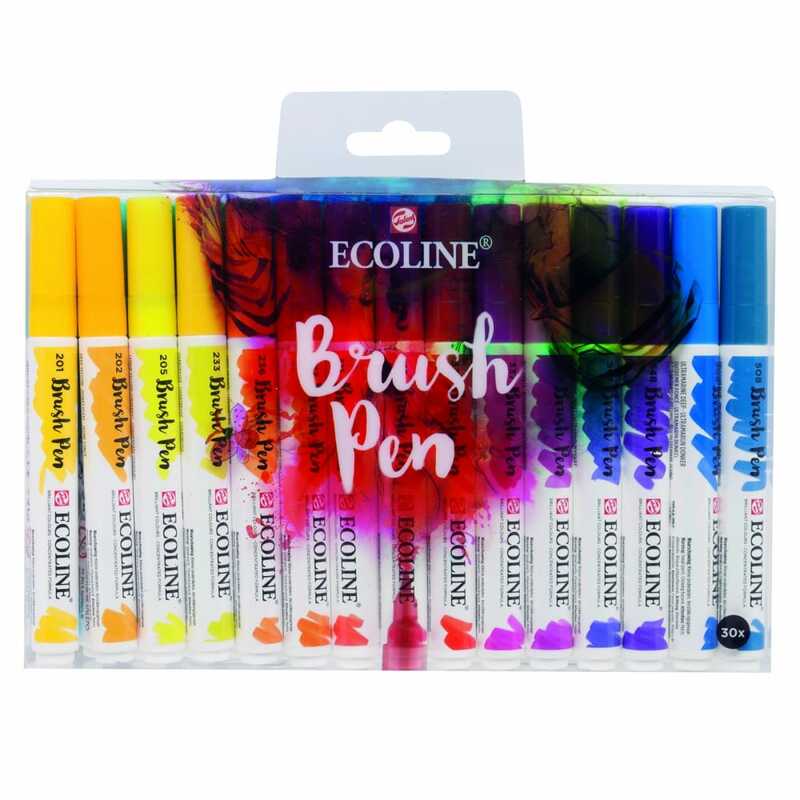 Ecoline Brush Pens are a real must for both crafters and artists with such a large range of uses, whether it is a quick sketch, adding colour to a rubber stamp, or even a full on watercolour scene -this is the tool to do them all! Please note the ink is quick drying - but not lightfast so keep your work either in a portfolio, a sketch book or behind UV filtering glass. Showing 2 Royal Talens Ecoline Brush Pen Set of 30 Markers reviews. Average rating of Excellent. Would you like to write a review? Fab pens for journaling, I just love them. Wowzers these paint pens are amazing and in my humble opinion just as nice as any other more expensive types than these ones. Easy to use and blend with water. Can you tell I will be buying more? !